The Dri-Pak name came from our ability to effectively pack salt and ensure a dry product. Although our range of products has expanded to include traditional cleaning & laundry products, packing salt remains our single biggest specialism. We are serviced daily by numerous tankers from the salt production facilities in Cheshire. The next time you sprinkle salt on your chips, the chances are we packed it! We do offer Dri-Pak brand salt in retail and catering sizes; for larger customers that meet our minimum order quantity, we contract pack PDV (cooking and table salt), Rock or Sea Salt and most recently, Himalayan Pink Salt. 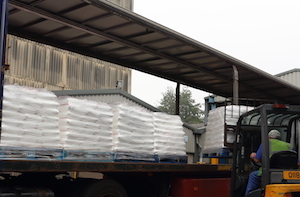 We also pack the vast majority of UK dishwasher salt, granular salt of the highest purity sourced from Cheshire. Again, we can offer retailers and wholesalers our own 2kg bag of Opal brand dishwasher salt or your own brand in a range of sizes, from 1kg to 5kg. It's not just our capabilities in terms of capacity that our customers like, it's our flexible approach. With a dedicated logistics fleet we can fulfil your order, usually within five working days. Of course we have all the relevant BRC certification and would be happy to provide advice on product, packaging and design. Our flexibility of service means that we work with other family-run firms, up to multi-nationals. Contact Us for an informal and confidential discussion about your requirements.